Don Warrington leads the company and gives an impeccable performance as the ageing monarch. A theatrical pressure cooker, director Michael Buffong ensures a constant bubbling apprehension. 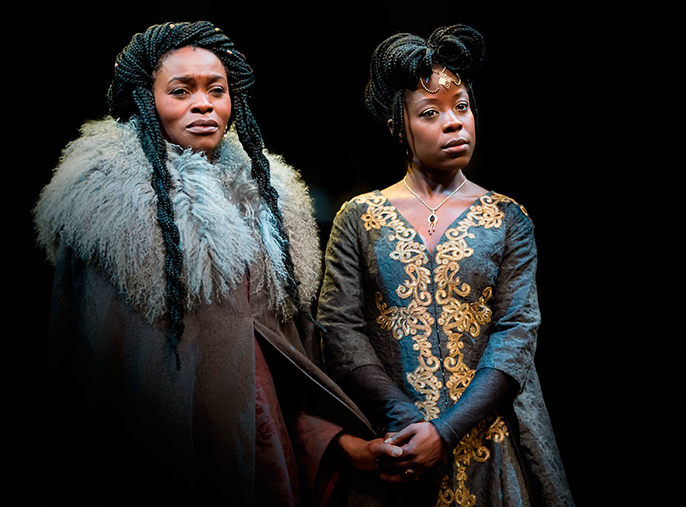 Talawa’s robust King Lear (see listing) is Shakespeare in its purest form. Set in the original context of a Pagan England, the courtly tragedy has a rustic fervency which is skilfully portrayed by the cast. 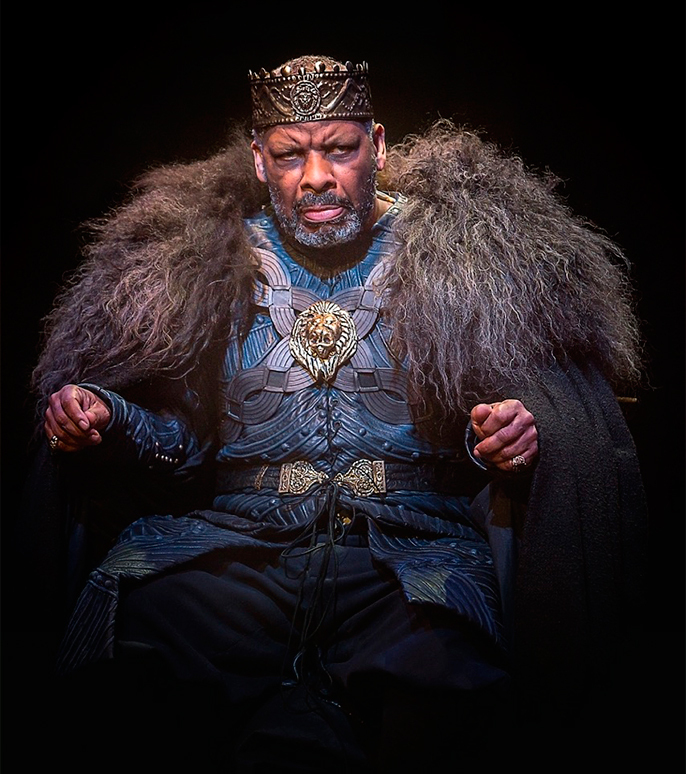 Don Warrington leads the company and gives an impeccable performance as the ageing monarch. A theatrical pressure cooker, director Michael Buffong ensures a constant bubbling apprehension. This makes the production completely engrossing, drawing the audience into the tangled web of schemes, subplots and false identities. Though grandiose in nature, the play expresses the universal experience of feuding families and old age palpably. Herein lies the play’s core tragedy. A man betrayed not only by kindred, but by his own mind. Warrington masterfully captures the frustrated impotence of senility. In earlier scenes we see the King desperate to assert his authority with a stern, set mouth and gruff retorts. His stubborn bravado later gives way to childlike abandon as he wanders around the stage in a crown of wheat. Lear’s waning strength is juxtaposed with the increasing boldness of his two pernicious daughters. Goneril played by Rakie Ayola grows ever more cunning and blatant in her quest for the throne. Yet Ayola’s portrayal suggests less of a tyrant so much as a neglected child, intent on repaying her father’s rejection. Debbie Korley’s Regan is more impulsive, switching from absent-mindedly unbraiding her hair to shrieking bloodthirsty orders. Whilst the play conforms to the original setting, complete with medieval gowns and flaming torches, it retains a modern edge. It is highly cinematic, with an echoey soundscape and dynamic use of lighting from the opening scene. An imposing Lear is silhouetted offstage, his features gradually materialising as he makes his entrance into the round. Creative choices such as the sneeringly camp Oswald played by Thomas Coombes bring some playfulness to the proceedings. Miltos Yerolemou is also fantastically ingenuitive as the Fool. A mournful character, whose comical appearance contrasts with his sage wit. 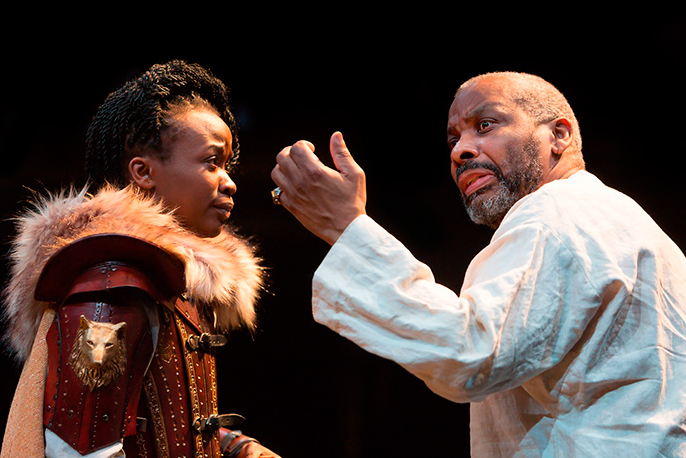 Both compelling and moving, Talawa’s King Lear brings Shakespeare’s tale to life with remarkable verve. Set in the round, the simple set consists of an earth floor designed by Signe Beckmann. With a few props, this easily lends itself to the various settings of drafty castles, cliff tops and heaths. It also reflects the feudal setting, a time when man was entirely subject to the elements. This is magnificently expressed in the famous ‘Storm scene. ‘As a crazed Lear entreats the skies to “Rumble thy bellyful! Spit, fire! Spout, rain!” the heavens open onto the stage, drenching the frenzied king and his Fool. A further scene upon the stormy heath sees the introduction of Poor Tom, the Earl of Gloucester’s son Edgar, in the guise of a lunatic. Played by Alfred Enoch, his spasmodic movements and manic outbursts are harrowing.